Amino acids are the basic building blocks of protein. Peopel who exercise may require greater amounts of protein and amino acids than sedentary people. Amino 6000 Capsules are packed with a concentrated source of Branched Chain Amino acids (L-leucine, L-isoleucine, L-valine) and L-form Amino acids which promote muscle strength, protein assimilation and muscle recovery. Each serving contains 6000mg of high-quality potassium caseinate providing essential and non-essential amino acids in easy to digest capsules. As a dietary supplement for adults, take ten (10) capsules daily on an empty stomach with 8 oz. of water or your favorite beverage, or take five (5) capsules two times daily. Other Ingredients: Capsule (gelatin, silicon dioxide) and stearic acid. Contains only naturally occurring amino acids. 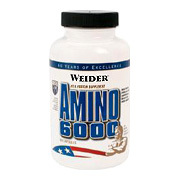 Amino 6000 is shipped in a discrete, unmarked package. Order are processed immediately and usually take about 3 to 5 working days to be received. We do ask that you try it for 2 to 3 weeks to feel the full effects. Any information received is used only for order processing and shipping purposes. Your information, such as e-mail address, will never be disclosed to a third party.